Showcased on the stand run by the local dealers, Agricar, Bryson Tractors and Lothian Tractors, will be examples from the popular T5 and T6 ranges, as well as the highly acclaimed 125 Roll Baler. New Holland was one of the star exhibitors when the show opened at the Royal Highland Centre, Ingliston, Edinburgh, on Wednesday November 20th. In the livestock-focused line-up was the TD5.95 Power Shuttle making its first appearance at AgriScot. By its side the T5.105 Deluxe Model, which is proving a perfect replacement for the popular T5060 model. The T5 fits into the horsepower range from 95 to 115, it’s ideal for so many uses. 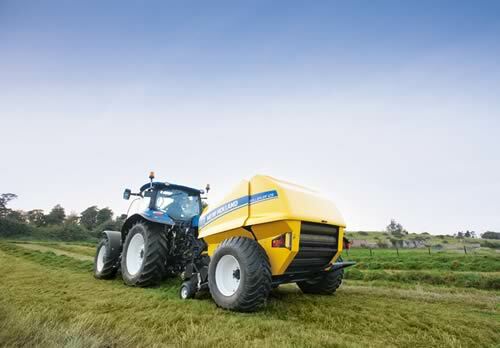 The headline trio of tractors was completed by the T6.140 Active Electro Command. The T6 range boasts horsepower of 143-175 with Engine Power Management, so it’s a compact sized tractor with big capabilities. Adding to the impressive line-up is the 125 Roll Baler, a great addition to New Holland’s world class baler range and also available as a combi unit able to provide net free wrapping. This is its first outing at Agriscot. To help customers at every step of the purchase, New Holland is offering zero per cent finance packages on all T5, TD5 and T6 tractors, plus extra discounts on the TD5.105, T5.105 and T6.140. “We are expecting a busy show this year,” said Bryson Tractors managing director Nancy Bryson. “With farmers looking closely at costs, New Holland is constantly reviewing their products to provide the greatest choice and affordable options for their machinery purchases. “With farmers promoting consumers to ‘buy British’ and New Holland still producing tractors in the UK, this has become a major factor in decision-making.